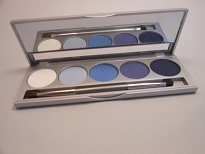 This eyeshadow kit in five shades of blue can go from demure to va-va-voom. Shadows glide on and can be mixed to make any shade of blue possible. Great for brown and blue eyes. Can be wet for liner, also.